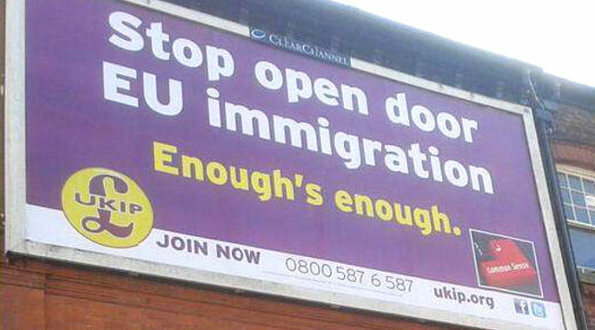 UKIP are currently running a poster in Manchester featuring the headline ‘Stop Open Door EU Immigration’. The poster has caused controversy in the area and led to the local community lobbying the media owner – Clear Channel – to remove the poster. There was a brief hiatus over the past few days whilst the media owner decided their position. Thankfully, for the sake of freedom of speech, Clear Channel have decided to allow the poster to remain. This is not the first time that media owners have been put in a compromising situation with regards to running controversial political advertising and it will not be the last; the reason for this is that the Advertising Standards Authority refuses to rule on political advertising. Political advertising in the UK is a free-for-all. Parties, pressure groups and trade unions can say whatever they like in their advertising without fear of recrimination. They can – and do – promise the world and have no obligation to deliver against it. This is completely contrary to the rules for all other advertisers, who have to comply with rigorous self-regulatory standards. It is quite literally one rule for the people and one rule for the politicians. There are many problems with this approach from a democratic perspective, but the one which this UKIP case has revealed is that media owners are getting landed in hot water with the public by having to decide whether or not to run advertising that may be controversial. If the media owners refuse to run advertising there is a serious risk of infringing on the right of political parties to freedom of speech and landing themselves in a law suit. By changing the self-regulatory system to force the ASA to include political advertising in its regulation of what is legal, decent, honest and truthful advertising (and what isn’t) it removes the possibility of political parties having their freedom of speech infringed upon and prevents landing media owners in controversy.